Todi, a very popular small Umbrian hilltown is situated halfway between Perugia and Terni, was founded by the Umbrians around 2700 BC and shows traces of both Etruscan and Roman civilization. The name Todi is thought to have originated from the word “tutor” (border) or “tutus” (fortified hilltop), and due to it’s elevated position on a two-crested hill overlooking the east bank of the Tiber river, Todi has stunning views overlooking the surrounding Umbrian countryside in all directions. First built on land occupied by the Umbri, Todi was later taken over by the Etruscans, and then in 89 BC by the Romans who leveled Todi’s two hilltops to make Piazza del Popolo, the historical center of the town which probably looks very similar today as it did during the Middle Ages. 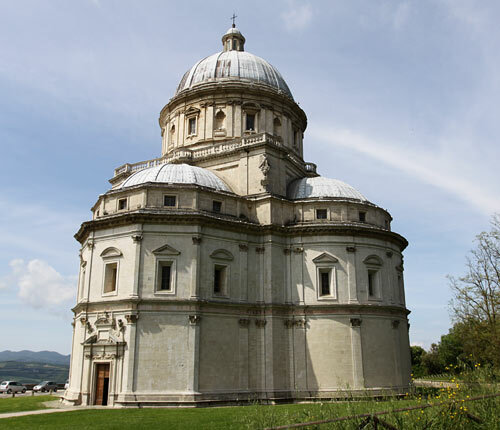 How to arrive in Todi – Visiting Todi is best accomplished by car as access to Todi by public transportation is not easy. The town has two train stations on the FCU line between Terni and Perugia, but both are outside the town and require a bus ride from the train station to the historical center. One can take a bus from Perugia, which run about six per day and stop in Piazzale della Consolazione. By car, it’s best to park at Porta Perugina, Piazzale della Consolazione, or Porta Romana. Important things to see in Todi – All of Todi’s main sights are within a few minutes walk of each other easily accessible on foot. The triple walls of Todi are still apparent. The innermost wall, built of rough grey travertine stone, is Umbrian or Etruscan, while the middle wall is Roman, and the outside wall dates from the sixth or seventh century. Dedicated to Maria Santissima Annunziata, the Cathedral, founded in the 12th century, is a Gothic structure showing Lombard influence and built on the site of a Roman building although it wasn’t completed for another 200 years. After being destroyed by fire in 1190, the church we see today was almost totally rebuilt. An 18th century flight of steep steps leads up to an immense wood carved door set into a decorative framework. The main feature perhaps of the squarish façade though is said to be the rose-window, added in 1513. Inside, the church has a decorative beamed roof and houses some impressive Frescoes and panels. The choir includes the Gothic altar and a magnificent wooden choir enclosure, built in 1521 with two floors. There is also a 13 century Crucifixion of the Umbrian school. The crypt which is also worth a visit, contains three sculptures which originally adorned the outer facade of the cathedral. Palazzo del Popolo of Todi is one of the oldest communal buildings of it’s type in Italy and construction began in 1213. The Palazzo del Popolo is a Lombard-Gothic construction and is composed of two great halls: the “Sala Grande Inferiore” or “Sala delle Pietre” and the “Sala Grande Superiore”. The Palazzo del Capitano of Todi, or “Captain’s Palace”, in Italian Gothic style was built around 1293 and faces the eastern side of the square. Also known as Palazzo Nuovo, it’s Gothic facade is enhanced by a monumental arched stairway that connects it to Palazzo del Popolo. It was built on two distinct levels, and presently houses both the Town Hall as well as the municipal museums. Palazzo dei Priori of Todi is located in the southern side of the Piazza, facing the Cathedral and is considered the least attractive of the three palazzo in the square. It was began in 1293 and later enlarged as seat of the podestà, priors and the Papal governors. The trapezoidal tower was originally lower, and had Guelph merlons. The façade is most famous for it’s big bronze eagle by Giovanni di Giliaccio (1347). Tradition states that the town of Todi was built where an eagle had dropped a tablecloth taken from a local family enjoying an outdoor picnic. Palazzo Vescovile of Todi is located at the left of the Cathedral and was built in 1593 by Cardinal Angelo Cesi at his own expense. His crest is visible over the great portal, attributed to Vignola. The upper floors include a room frescoed by Faenzone and a gallery frescoed by Andrea Polinori in 1629. The Church of San Fortunato is the single most celebrated site in Todi outside of Piazza del Popolo and was begun in 1292 on the site of an existing church. The Church of San Fortunato is a Franciscan church, but was built with many anomalies, the most apparent being that the dedication was not made to the Assisi saint but to Fortunato, the patron saint of Todi. Construction of the church was suspended during the plague of 1348 and the lower part of the façade was finished in the second half of the 15 century although the remaining facade remains unfinished. The interior consists of a nave and two aisles which have one portal each and are surmounted by cross vaulting. These are enriched by fine decorations portraying saints and prophets, with briars representing Good (the vine) and Evil (the fig). The whole apse is occupied by a wooden choir finished in 1590 by Antonio Maffei, from Gubbio. The crypt houses a sepulchre containing the remains of St. Fortunato and other saints, as well as the tomb of Jacopone da Todi. Another noteworthy work of art is a Madonna and Child by Masolino da Panicale. The Church of Santa Maria della Consolazioneis obviously Todi’s most striking church, and sits just on the outskirts of the city center. It is thought to be one of Italy’s domed Renaissance churches. Santa Maria della Consolazione was begun in 1508 and finished in 1608. It has a Greek cross plan: three apses are polygonal and that on the north side is semicircular. The church was inaugurated in 1607. The distinctive exterior of the church is built on a square plan and rises to a great dome on top giving it a very impressive exterior silhouette. The interior is built in the form of a Greek cross, giving it an airy and light feeling. The altar houses a miraculous image of the Madonna, which is said to have been discovered by a worker during the laying of the foundations. Twelve niches in the first three apses house giant statues of the apostles. Also noteworthy within the church, is the wooden statue of Pope Martin I, himself a native of the Todi area.